Matthew Heimbach has finally crossed the Rubicon. Or was that the river Styx? 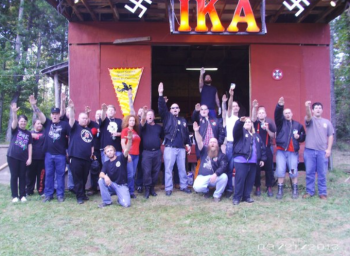 In the latest and most dramatic evidence of Heimbach’s transfiguration from a self-described “conservative” to a full-on neo-Nazi, a photograph has surfaced of the one-time founder of the White Student Union at Towson University sieg-heiling with a group of neo-Nazis and Klansmen (at far right in photo) standing under twin swastikas. If that wasn’t good enough, on Oct. 4, the same day the Anti-Defamation League (ADL) first published the photo taken last month, Heimbach announced on his Traditionalist Youth Network (TYN) blog that he would be speaking at a Nov. 9 Kansas City rally put on by the National Socialist Movement (NSM), currently the nation’s largest neo-Nazi group. In the same breath, he said he will be marching on Oct. 12 in Murfreesboro, Tenn., in a rally against “demographic displacement” hosted by the League of the South, a hate group that wants the South to secede again in order to create a country ruled by “Anglo-Celts” — white people. In posting the photo of Heimbach, the ADL noted that the event he attended was co-sponsored by the Aryan Terror Brigade, the NSM, the Knights of the Nordic Order and the Imperial Klans of America (IKA), which apparently hosted the event at its Kentucky compound. At least three of the groups have members who have been involved in criminal violence. In a 2008 civil lawsuit brought by the Southern Poverty Law Center against the IKA, based on three members’ beating of a teen they accused of being Latino, the group’s leader and others were ordered to pay a total of $2.5 million to the victim. The NSM is the kind of group that long favored dressing up in full-fledged Nazi uniforms (lately, they’ve gotten into Italian fascist, black BDU-type outfits). Its leader, Jeff Schoep, typifies the membership: In 1998, Schoep was convicted of helping the mother of his daughter burglarize some $4,000 worth of computer equipment while four of her children waited in their getaway car. Much later, in 2011, Schoep left his wife, who was undergoing breast cancer treatments, and took up with a younger woman who makes a living as a fetish model. Heimbach has been on a downward spiral since graduating from Towson, in Maryland, earlier this year. He has begun to talk of “conniving Jews” and “Jewish supremacists” (a phrase popularized by former Klan leader David Duke, who Heimbach now describes as a personal hero). He quotes terrorist assassin David Lane as another hero, and wore a pistol while speaking to the Council of Conservative Citizens, a descendant of the racist White Citizens Councils that resisted school desegregation in the 1950s and 1960s. He has begun calling for revolution and advocating a fight against “Jewish elites” and others.